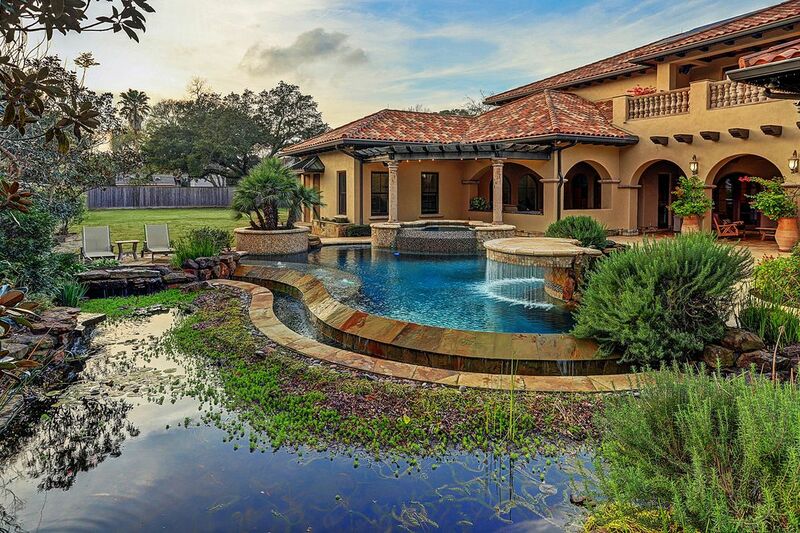 5409 Valerie Street, Bellaire, TX 77401 | Martha Turner Sotheby's International Realty, Inc.
BACKYARD PARADISE with pool and spa with fountains, meadering water garden, fire pit, outdoor kitchen and covered loggia with fireplace. 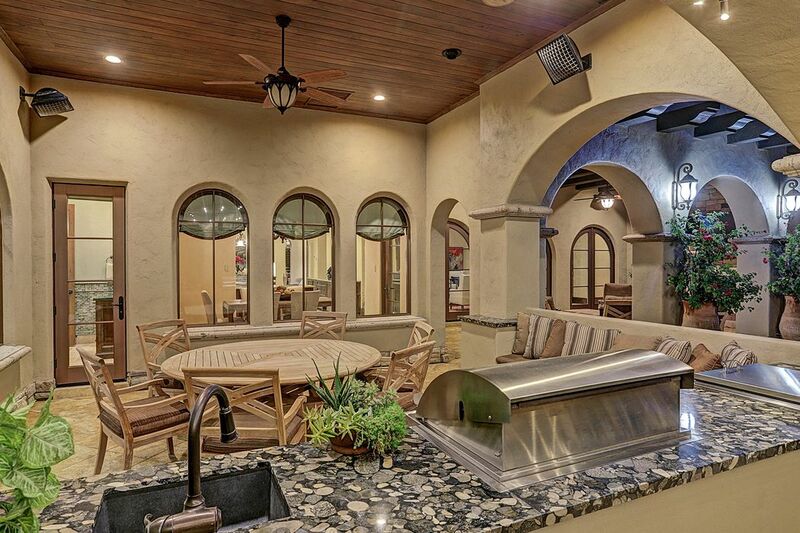 The large balcony off of game room upstairs overlooks the breathtaking beauty of this backyard. An AERIAL VIEW of the home on the large homesite with an auxiliary building that can be converted into a private casita for guests. 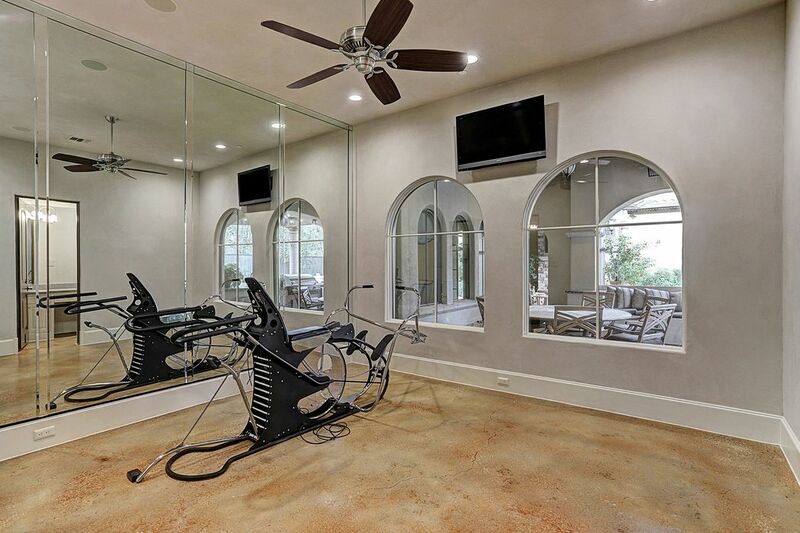 This home has covered parking for 7 cars. 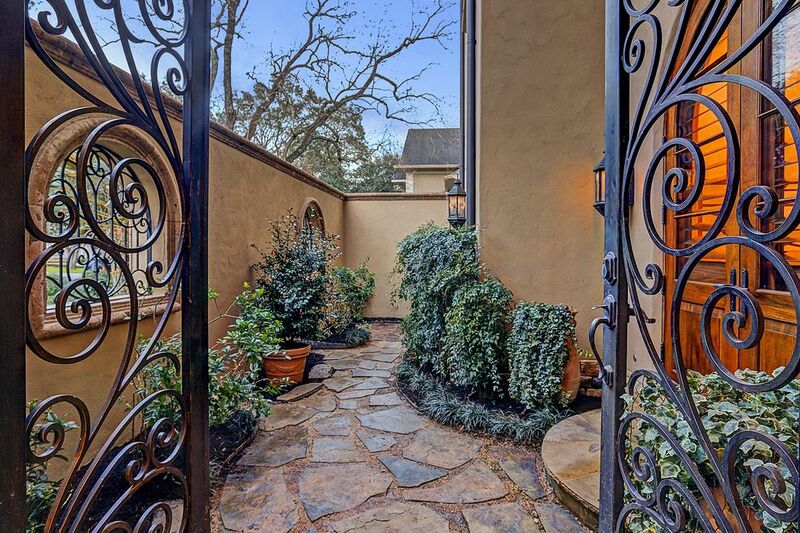 Private WALLED GARDEN in the front of the home can be accessed through double wrought iron gates off the Covered Front Porch and through double doors off of the Living Room and the Study. Looking back at the Covered Front Porch with the home's FRONT ENTRY through a mahogany front door. 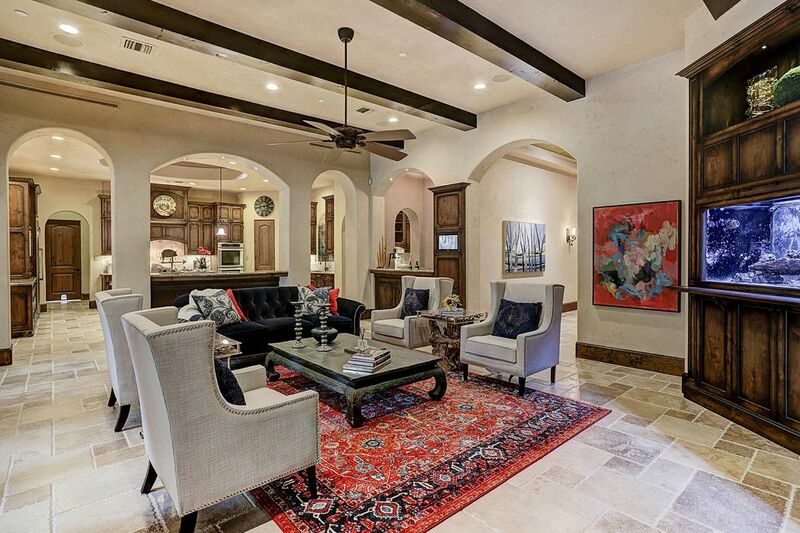 The FORMAL LIVING ROOM has graceful arched entries and hand-scraped walnut floors with a low-VOC finish. 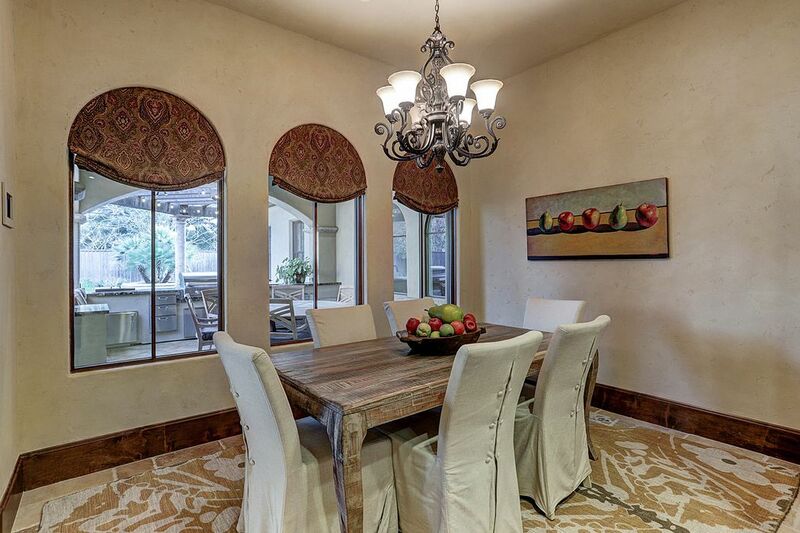 The FORMAL DINING ROOM has an arched entry from the Foyer and a double scalloped tray ceiling. 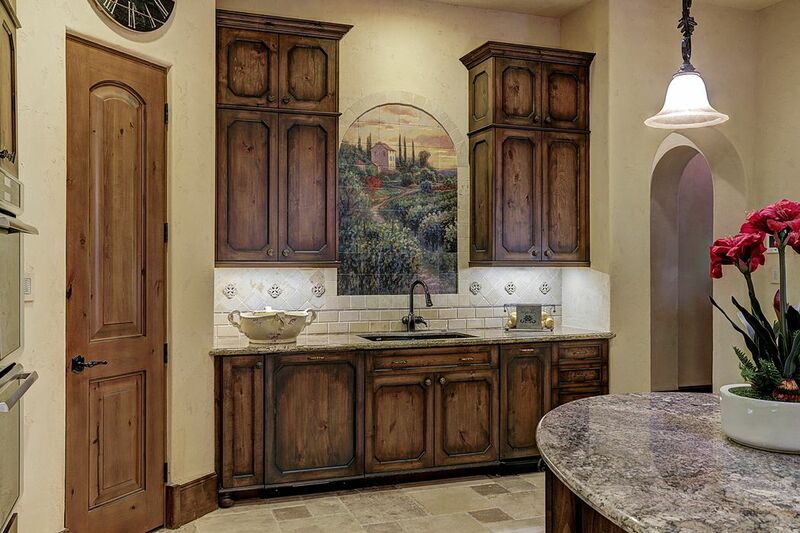 This lovely room is connected to the Gourmet Kitchen by the Butler's Pantry. 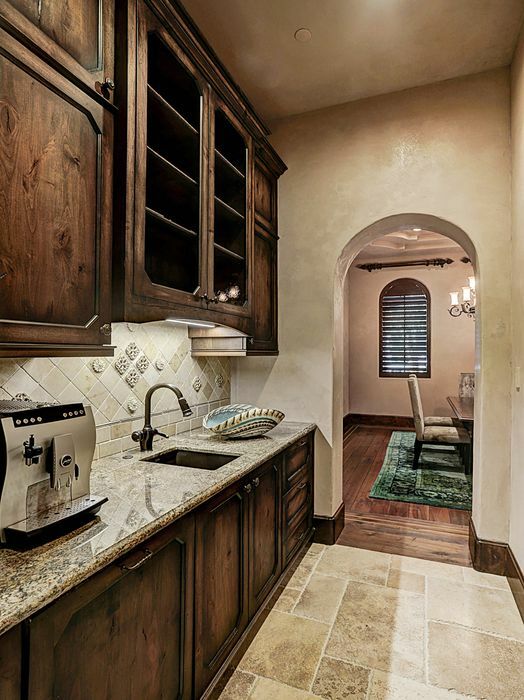 The BUTLER'S PANTRY has rustic alder cabinetry, a wide granite-topped counter with an undermount sink and chiseled-edge travertine flooring. 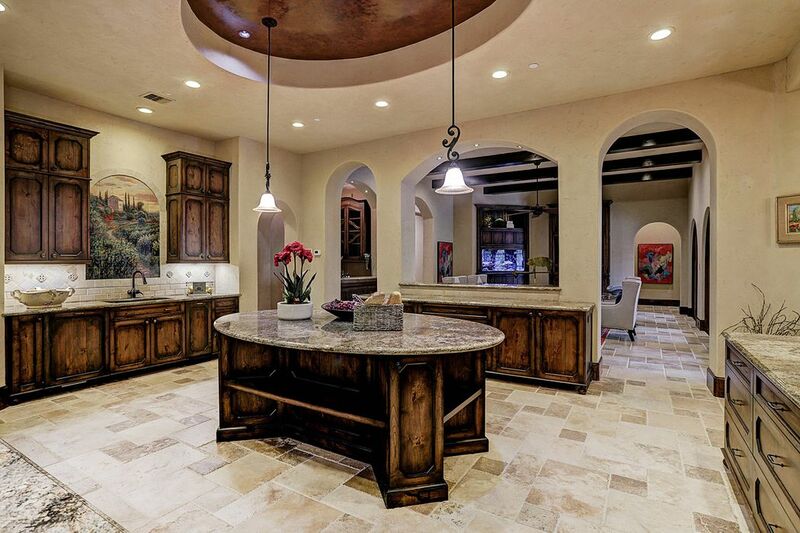 Notice the decorative travertine tile backsplash and glass-fronted upper cabinets. 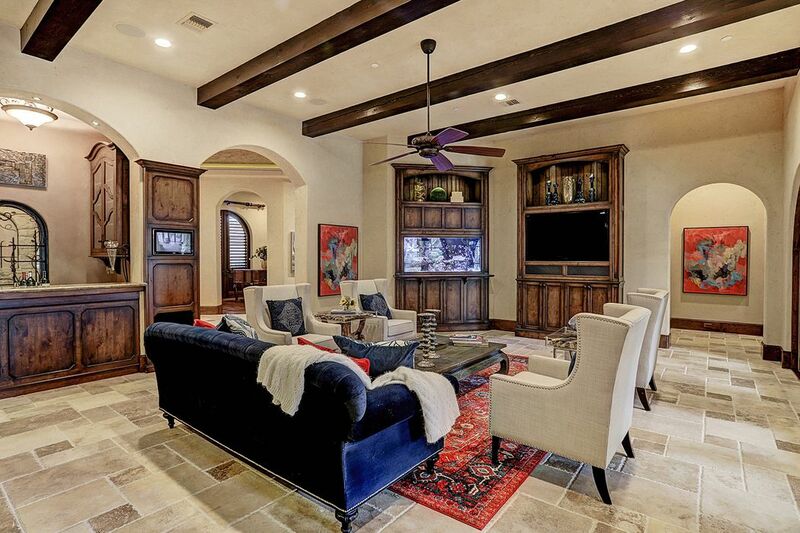 FAMILY ROOM has rustic alder built-ins, travertine flooring and a beautiful solid cedar-beamed ceiling. 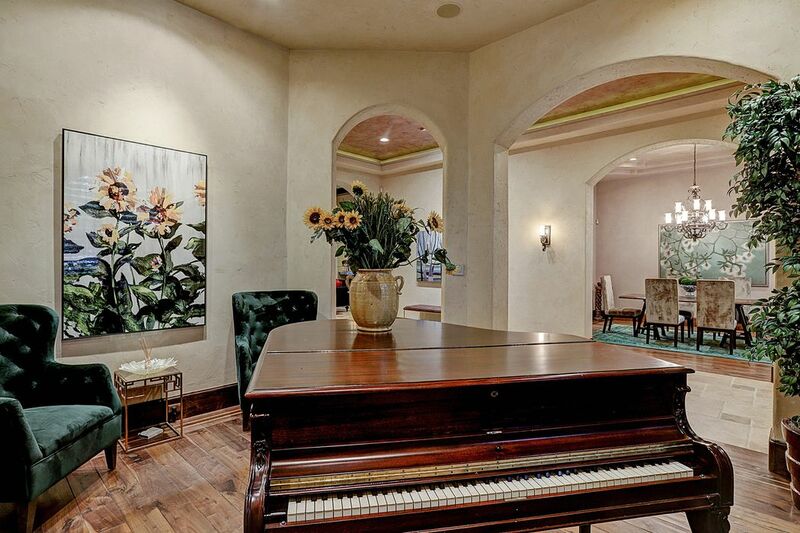 The arched alcove at the end of the room on the right leads to the Master Suite. 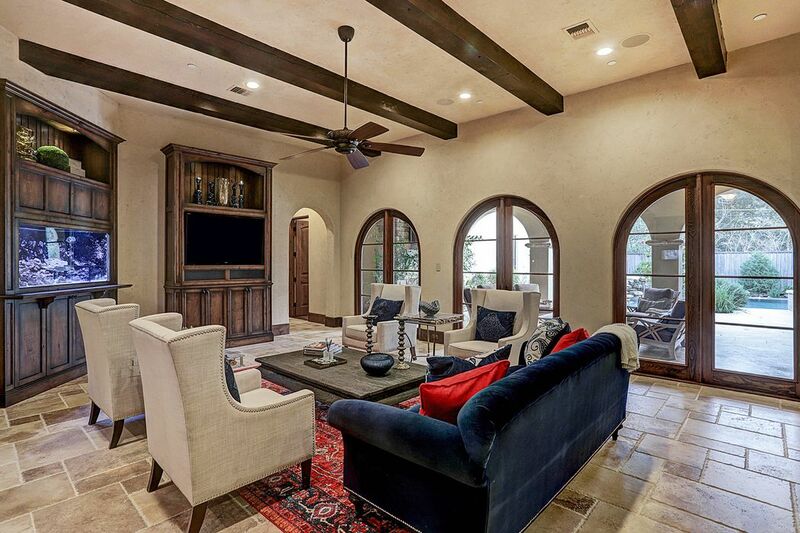 FAMILY ROOM with several sets of double arched windows and doors overlooking the Covered Loggia, Summer Kitchen and magnificent Pool & Spa. 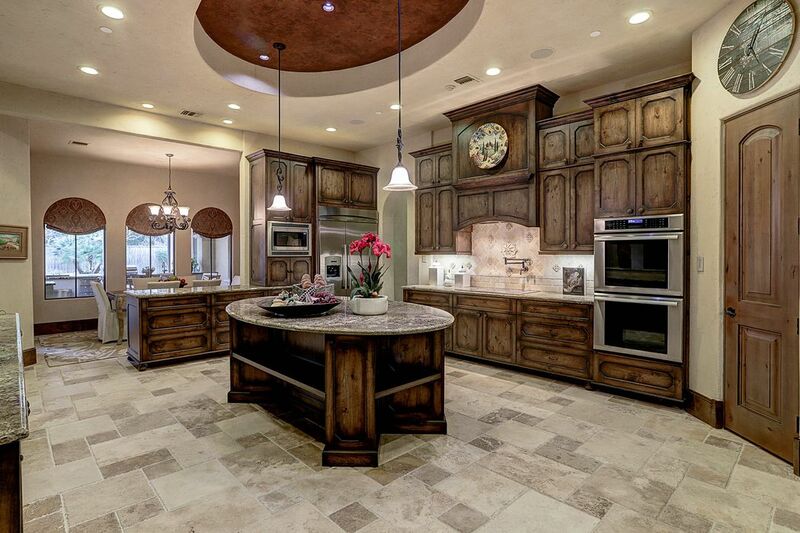 The large GOURMET KITCHEN has a large center island with a granite top and open shelving on all four sides. 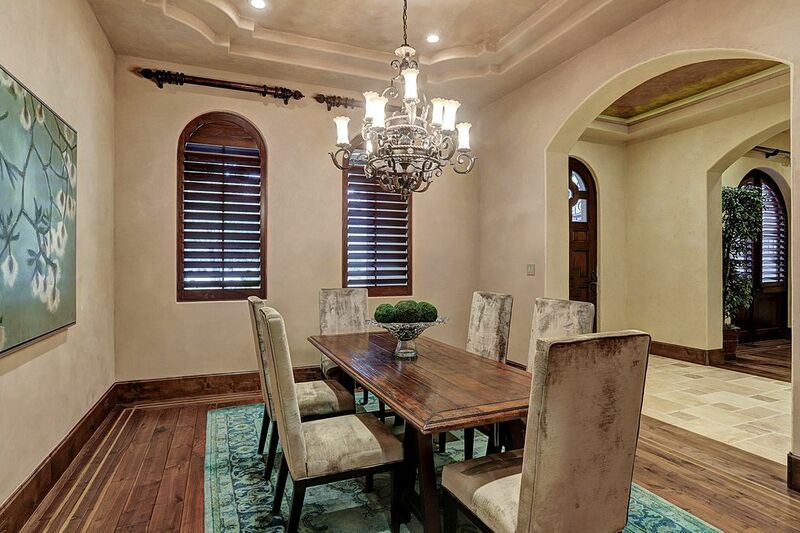 Above is an oval coffered ceiling with faux painted Venetian plaster. 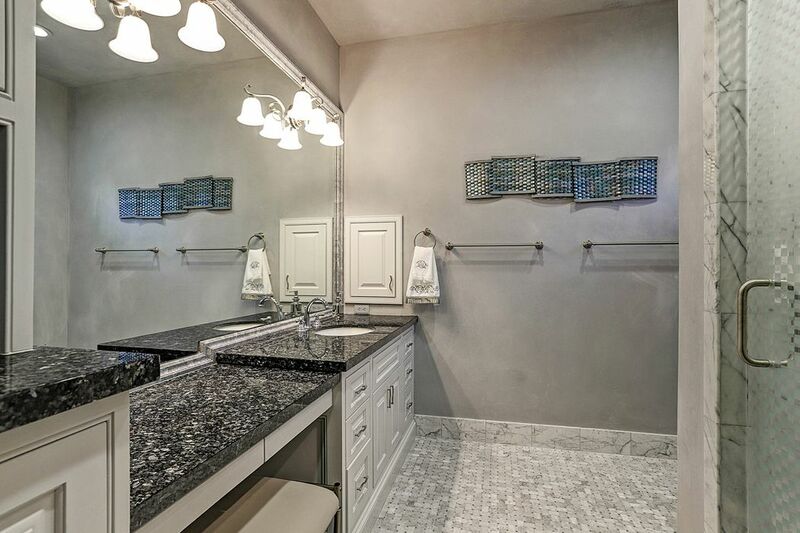 The built-in cabinets in the GOURMET KITCHEN are custom alder and there is a lovely hand-painted tile mural above the sink. 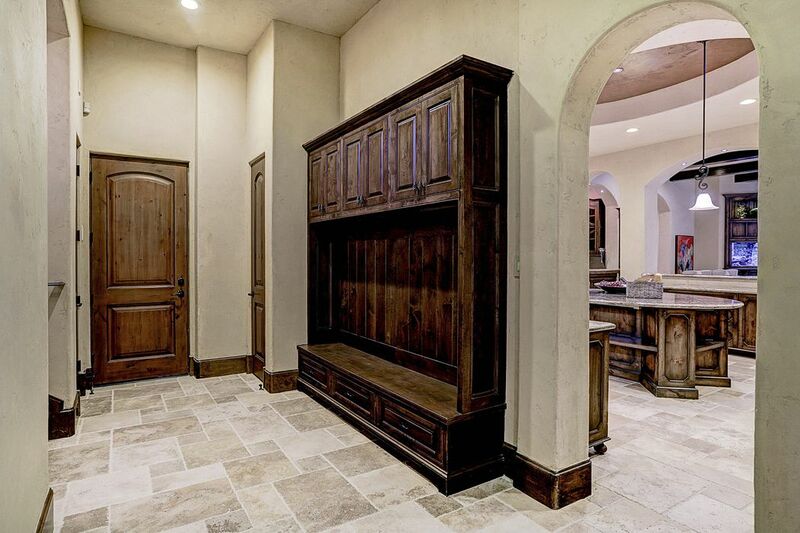 On the left is the door to a spacious walk-in Pantry. 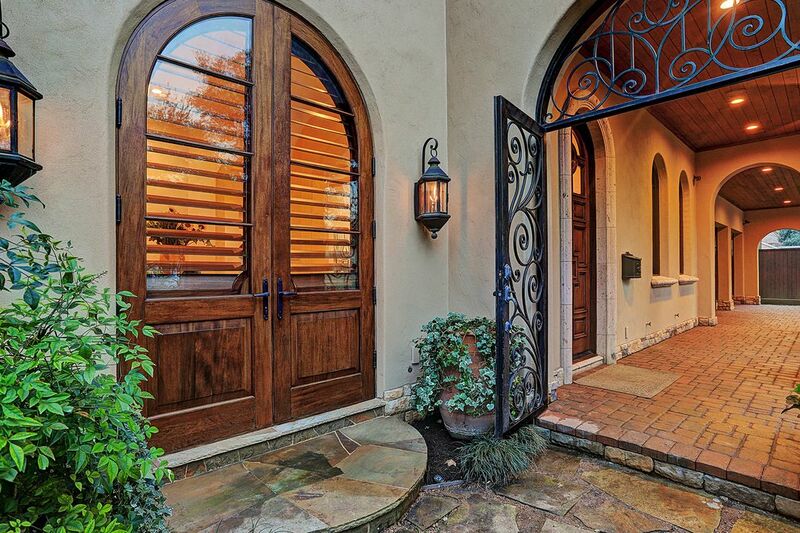 Adjacent to the Gourmet Kitchen and overlooking the Summer Kitchen, the BREAKFAST ROOM has chiseled-edge tumbled travertine floors, American clay plaster walls, and an exterior door to the Covered Loggia and Summer Kitchen. The MUD ROOM is off of the Gourmet Kitchen on the way to the Garage. Across from the convenient hanging space for coats and a bench for removing shoes is the Back Staircase leading upstairs. 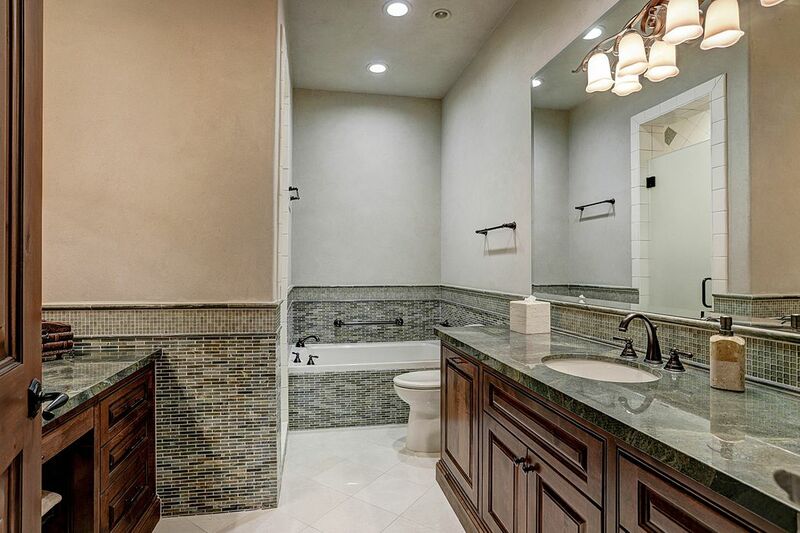 The 5th BEDROOM or EXERCISE ROOM has a full en suite Bathroom and a walk-in Closet. The floors are painted concrete and one wall is mirrored. 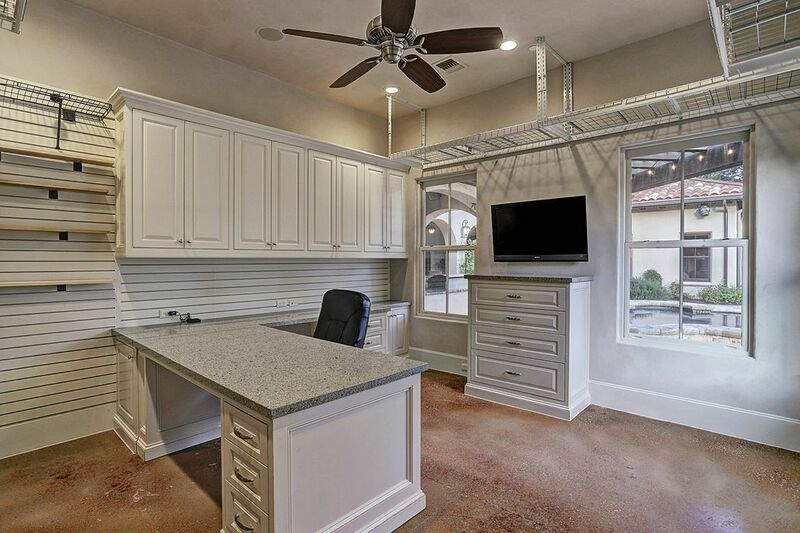 The CRAFTS ROOM has a built-in, moveable work space and plenty of storage cabinets, drawers and slot wall. 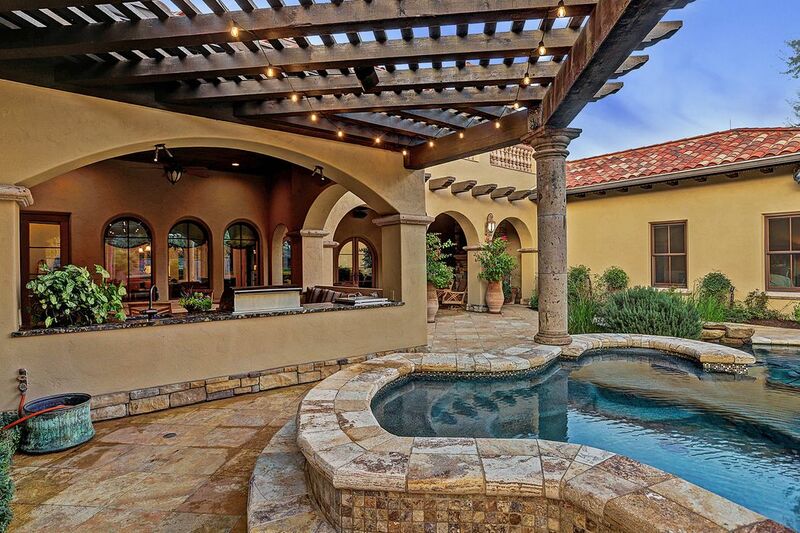 The floors are painted concrete and several windows offer excellent views of the pool, spa and backyard. 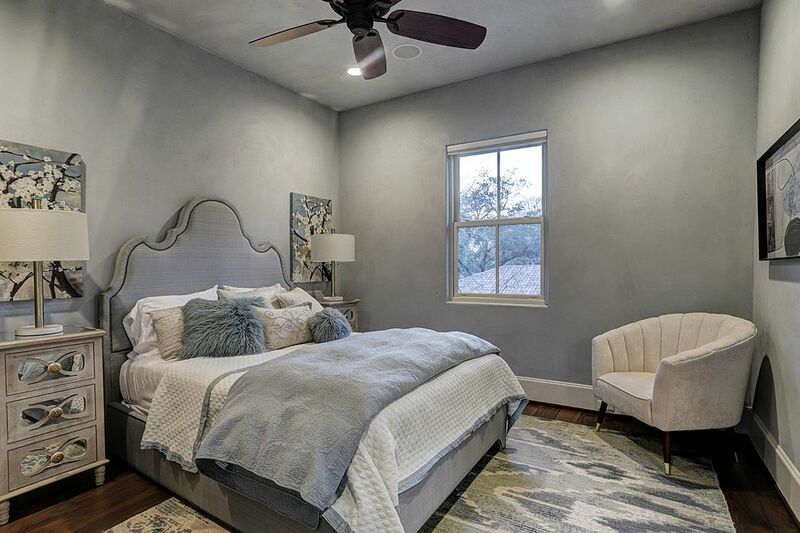 The MASTER SUITE has a scalloped tray ceiling, recessed, reading and art lighting, and two walls of windows with stunning views of the Backyard. 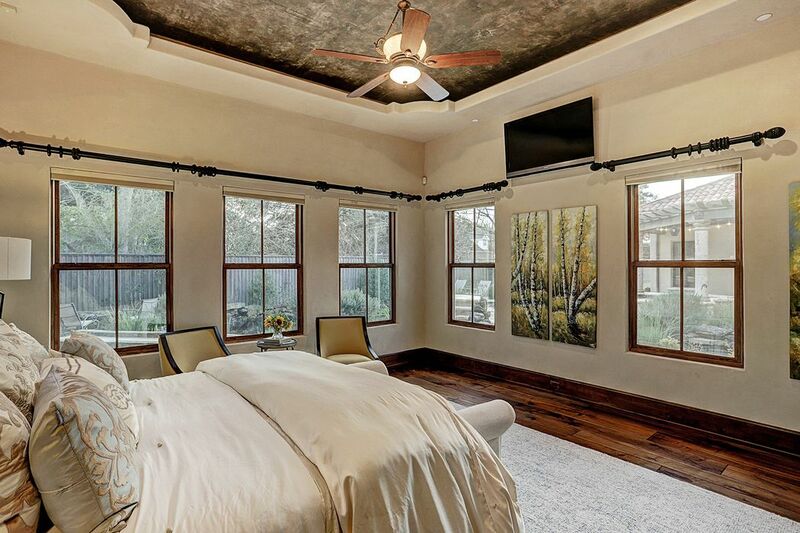 Five sets of wood-framed sash windows bring nature indoors in this spacious MASTER BEDROOM. 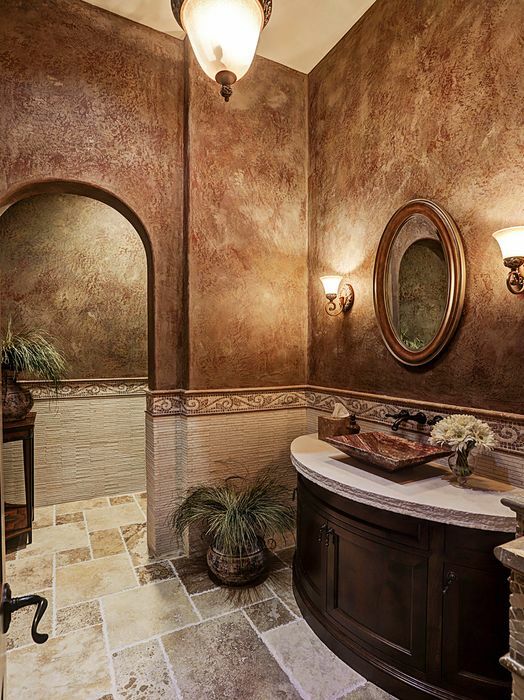 The luxurious POWDER BATH has faux-painted plaster walls with stone wainscoting, travertine flooring and a vanity with a limestone top and stone vessel sink. 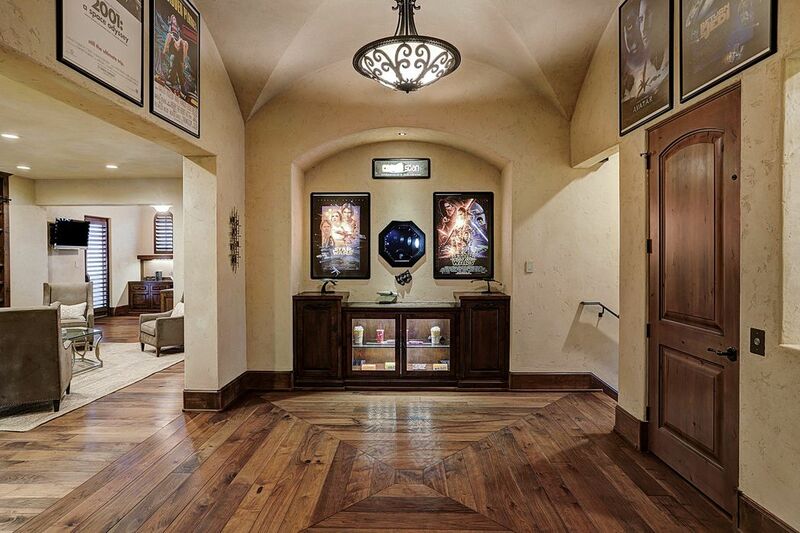 The Front Staircase ends at the THEATER LOBBY on the 2nd Floor with a groin-vault ceiling and its own Concession Counter and back-lit movie poster boxes. The ELEVATOR is behind the door on the right. 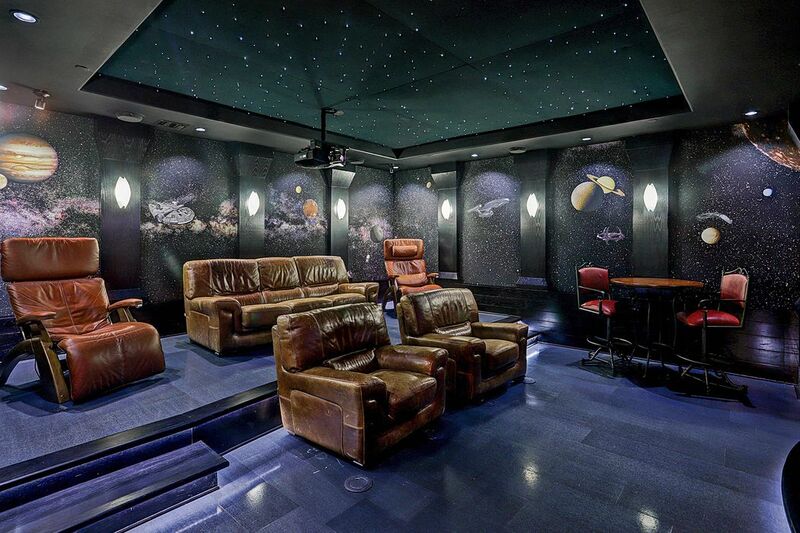 The HOME THEATER has LED Recessed Can Lighting and LED Rope Lighting on the Stage & Deck. There is a Sony High Definition Projector and the Black Diamond Screen is by Screen Innovations and is 130" diagonally. Wow! 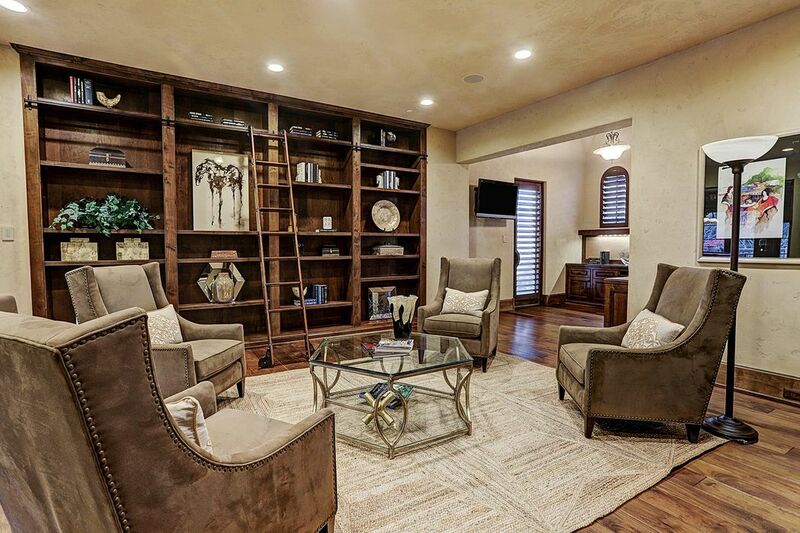 The LIBRARY has American Clay Plaster Walls and built-in Book Shelving with a Rolling Ladder. There is LED Recessed Can Lighting and a Sony Flat Screen TV in the Work Station. 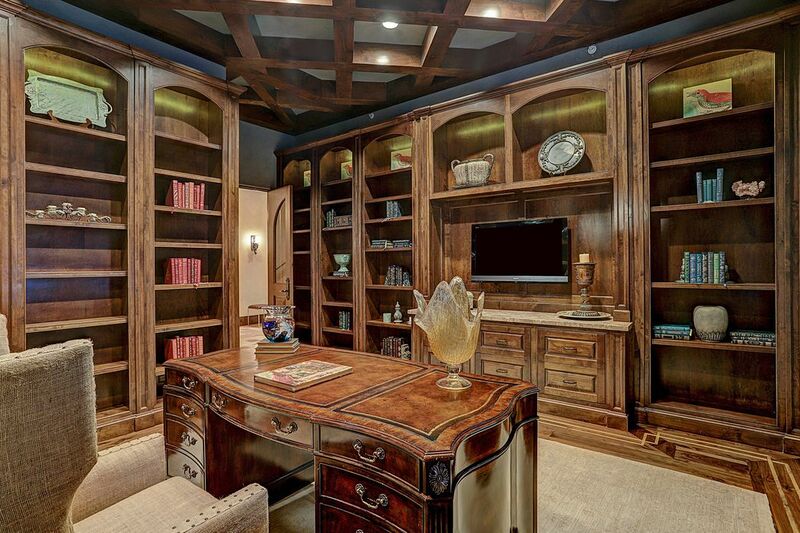 The WORK STATION has an attractive groin-vault ceiling, built-in work space made of alder and plentiful arched windows (with custom shutters) that overlook the Front Gardens. There is a front Balcony through the door on the left. Several double sets of divided light windows and doors overlook the wide UPSTAIRS BALCONY. 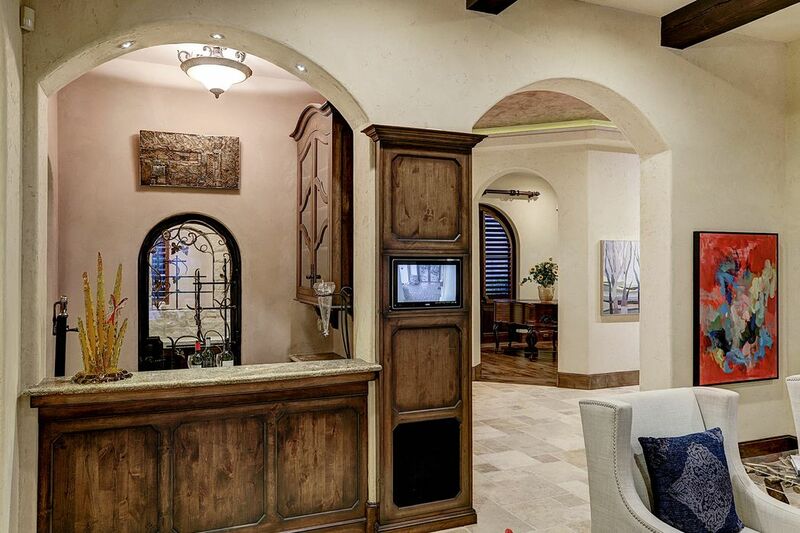 There is a WET BAR & MINI KITCHEN off the GAME ROOM with a microwave, dishwasher and refrigerator. 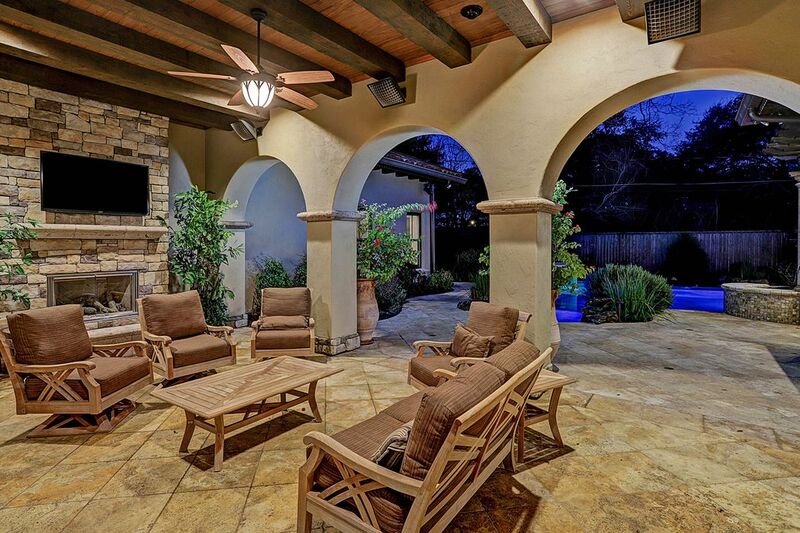 A LARGE UPSTAIRS BALCONY with an outdoor sink, storage cabinets, cooling fans, radiant ceiling heaters and speaker system is just off the GAME ROOM and overlooks the extraordinary Backyard. View of the POOL & SPA from the Upstairs Balcony. 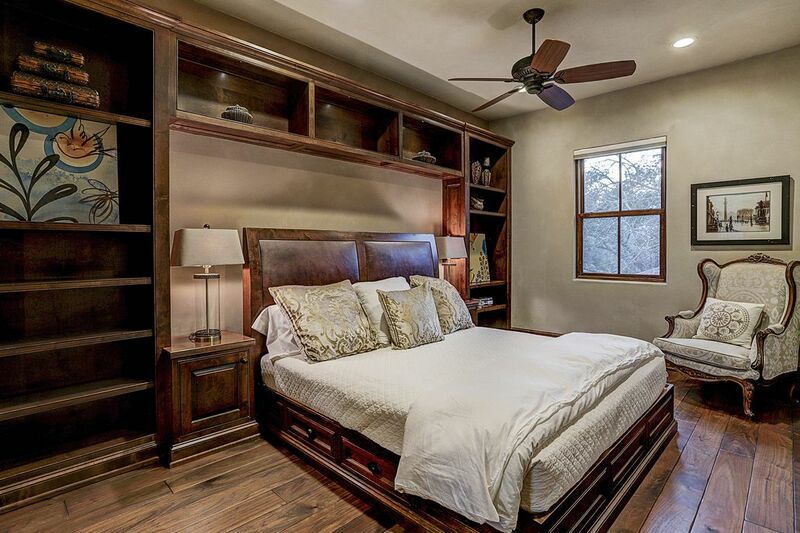 One of three SECONDARY BEDROOMS on the 2nd Floor with an En Suite Bath and spacious, customized Walk-in Closet. Notice the wide window seat and built-in corner shelving. The unique EN SUITE BATH for the previous Secondary Bedroom has a walk-in shower, marble flooring and gorgeous granite counters. 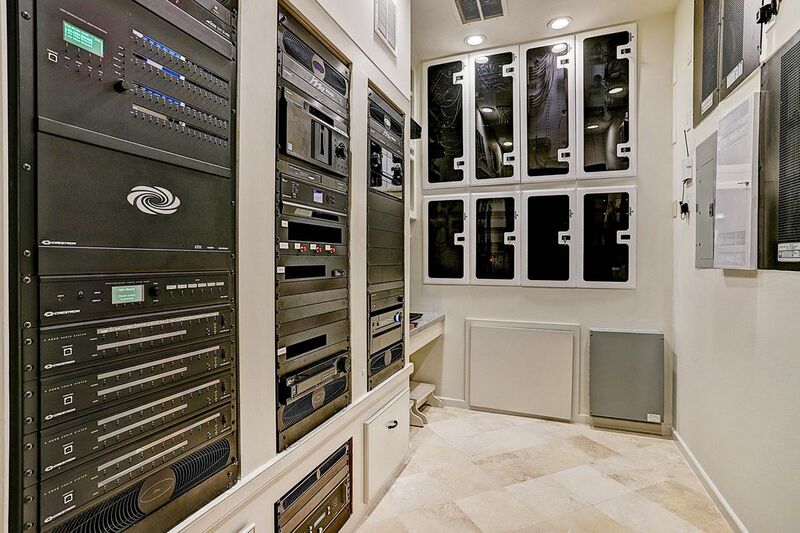 2ND FLOOR EQUIPMENT ROOM that contains all Security, Automation and Audio/Visual equipment for the home. 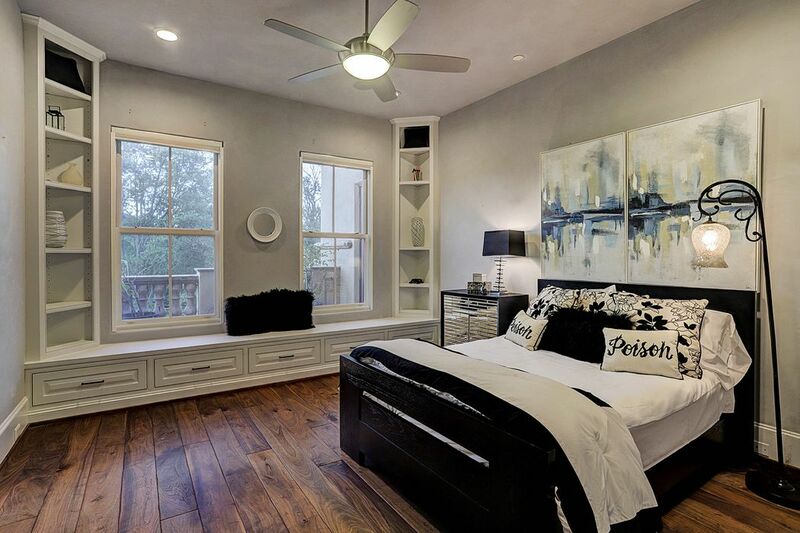 Charming SECONDARY BEDROOM with plaster walls, hand-scraped walnut floors and a window facing the large Side Yard. 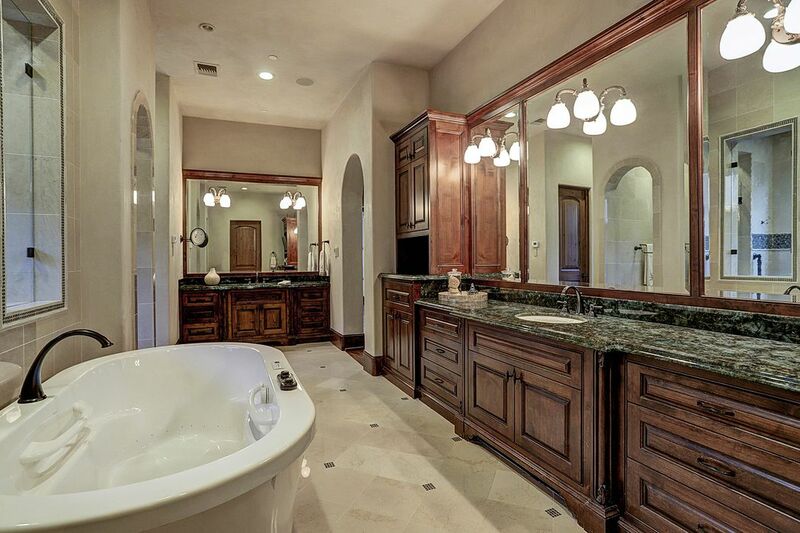 The elegant EN SUITE BATH for previous Secondary Bedroom has a corner shower, plaster walls and marble flooring. Another beautiful SECONDARY BEDROOM has exquisite alder built-in cabinetry and a wood framed sash window. 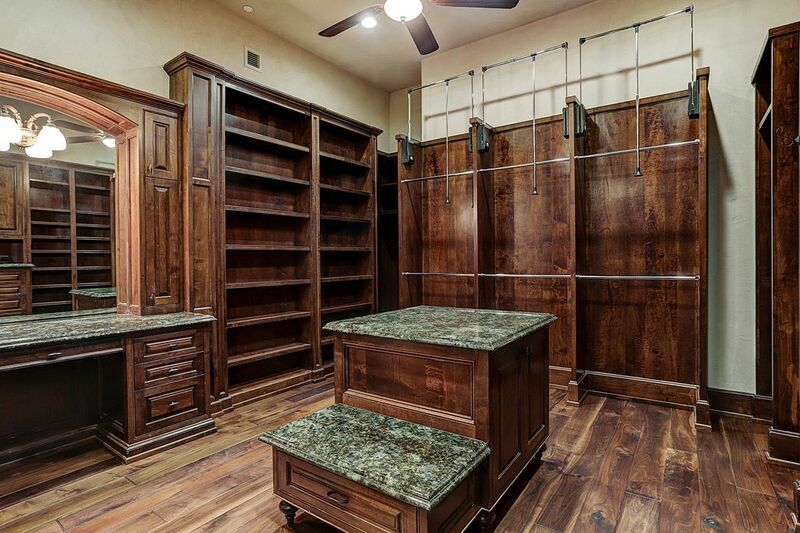 Unseen is a large customized walk-in closet. 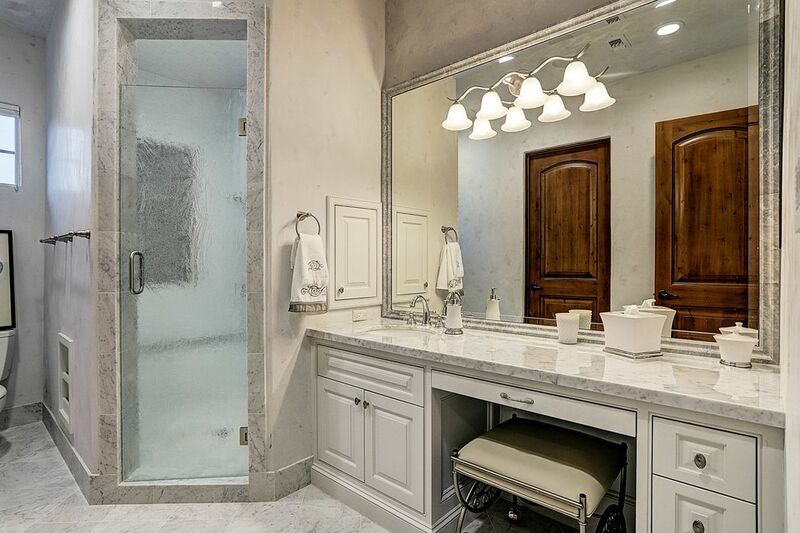 This lovely EN SUITE BATH has plaster walls with glass tile wainscoting, a deep soaker tub, walk-in shower, a vanity with a sink and an exotic marble top, and a make-up vanity with the same gorgeous marble top. 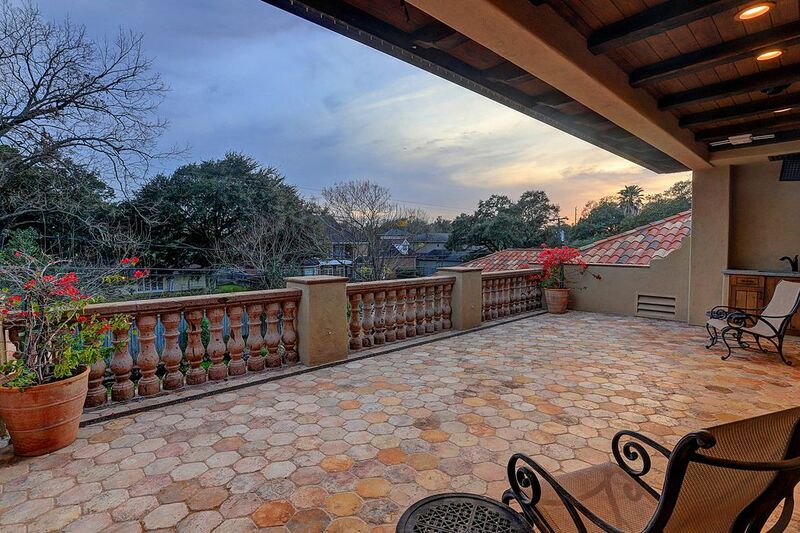 Outside of the FAMILY ROOM on the 1st Floor is a spacious COVERED LOGGIA with fireplace with a stone surround. 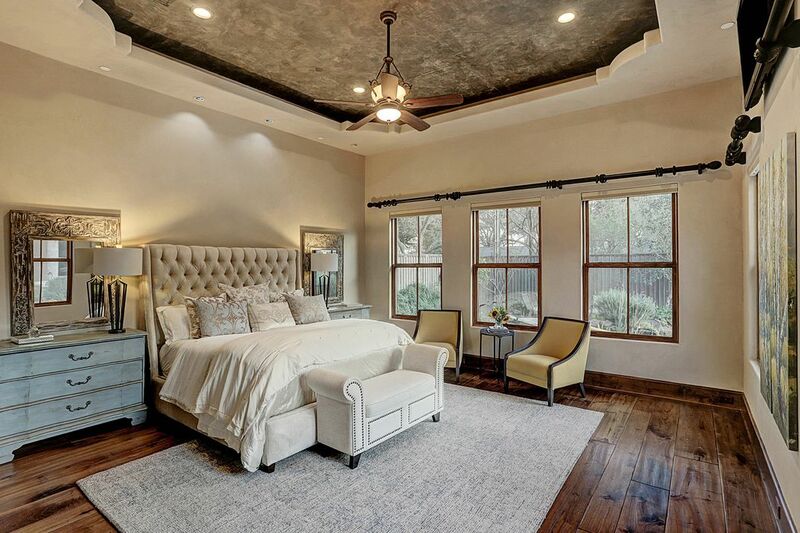 Overhead are solid cedar beams, radiant ceiling heaters and cooling fans. 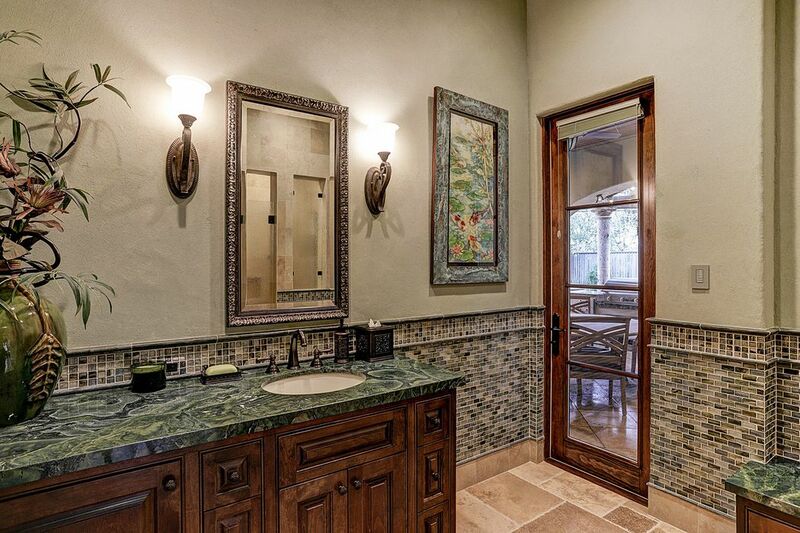 The POOL BATH has a walk-in shower, a wide vanity with a marble top, glass tile wainscoting under plaster walls, and a door leading to the Summer Kitchen, Loggia and Pool. The spacious 10 PERSON SPA has an infinity edge and variable speed energy efficient pumps. 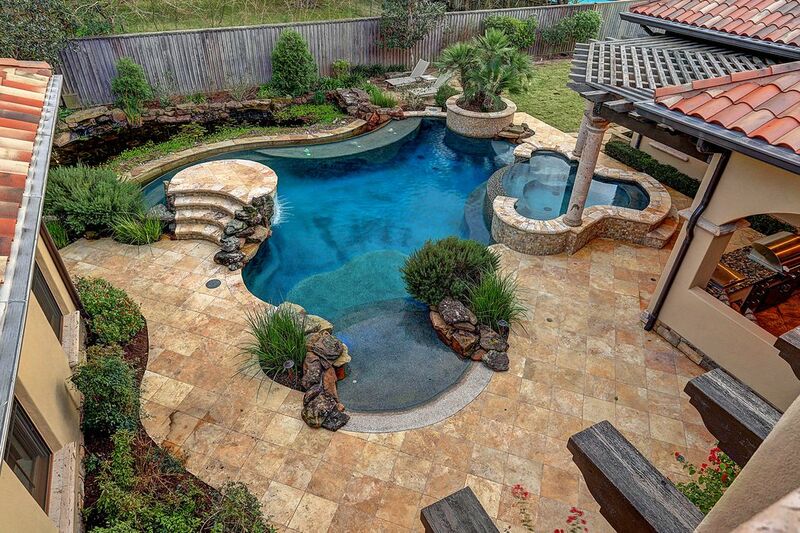 There is a gas pool and spa heater, and a heat pump for supplemental pool heating. The SWIMMING POOL holds 40,000 gallons of water and has a CL Free Sanitizing System that is chlorine-free, chemical-free and salt-free. It has a beach entry and a rain curtain platform. The pool's infinity edge overlooks the WATER GARDEN. An AERIAL VIEW of the property that shows the 22 SOLAR PANELS on the roof of the Main House. 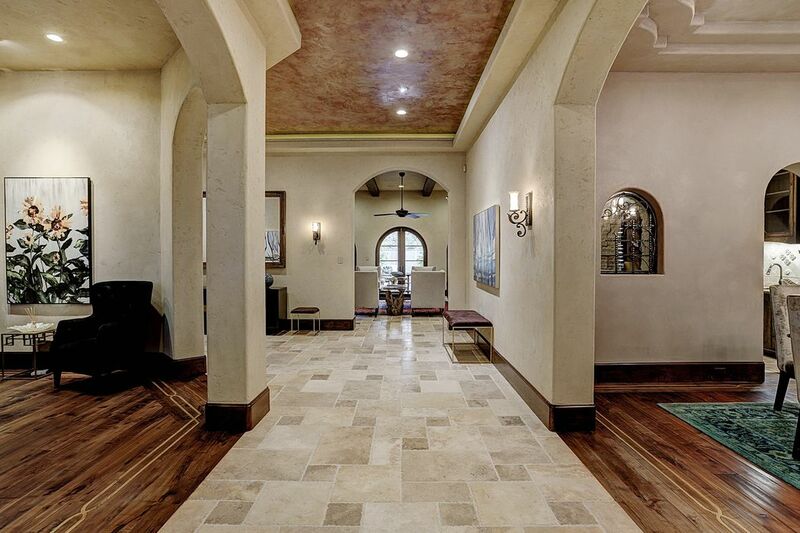 $4,700,000 5 Bedrooms6 Full / 2 Partial Baths9,182 sq. ft. 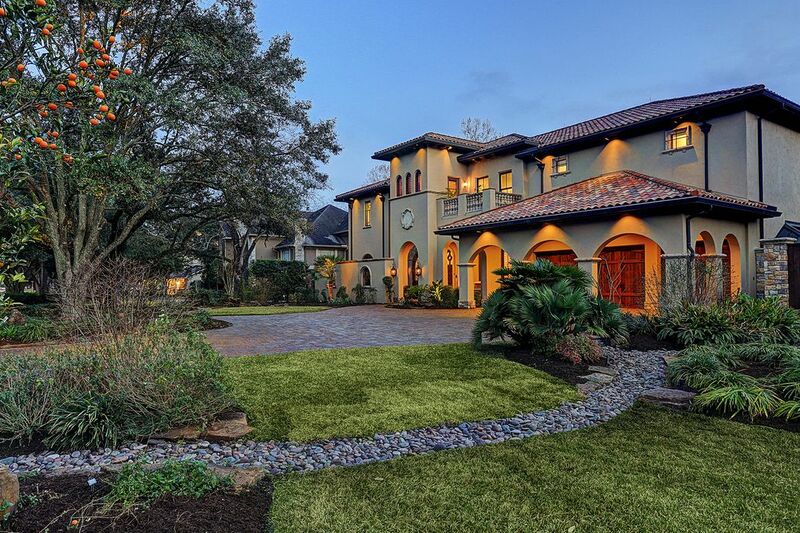 Exquisite Tuscan-style masterpiece on almost an acre. 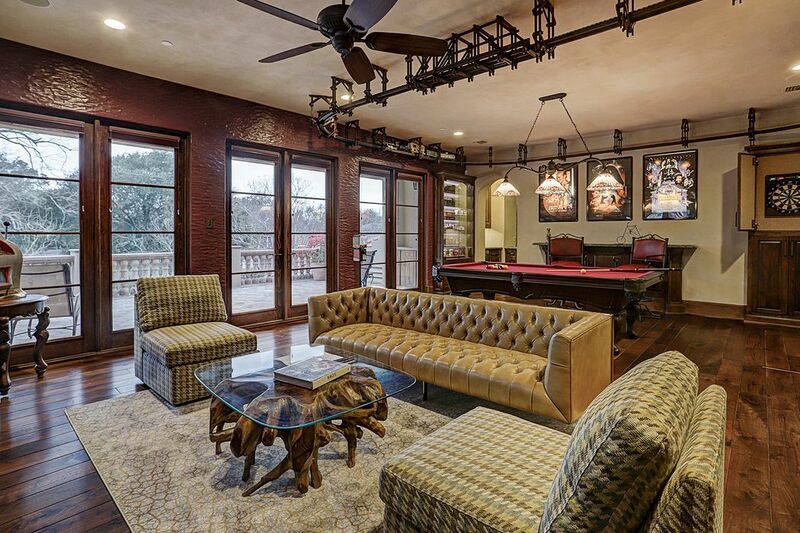 Master down, game and media rooms up. 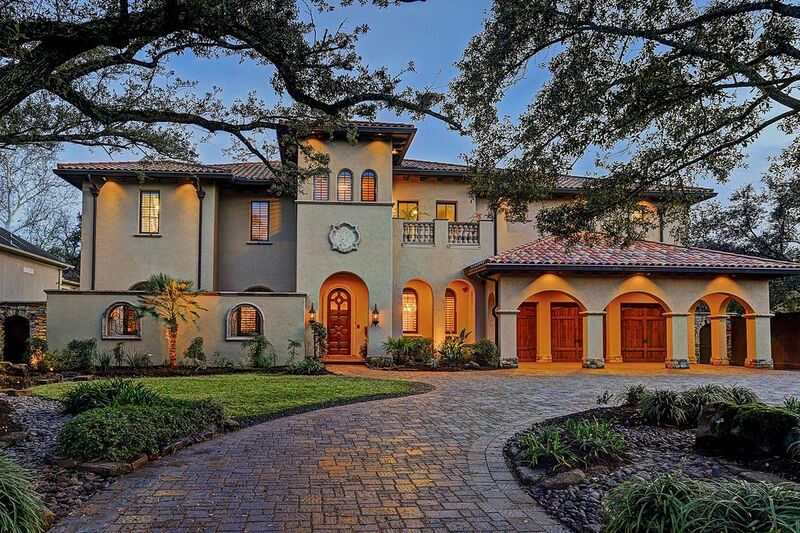 A perfect blend of exceptional design and architectural details, artisan-level craftsmanship and extraordinary beauty. 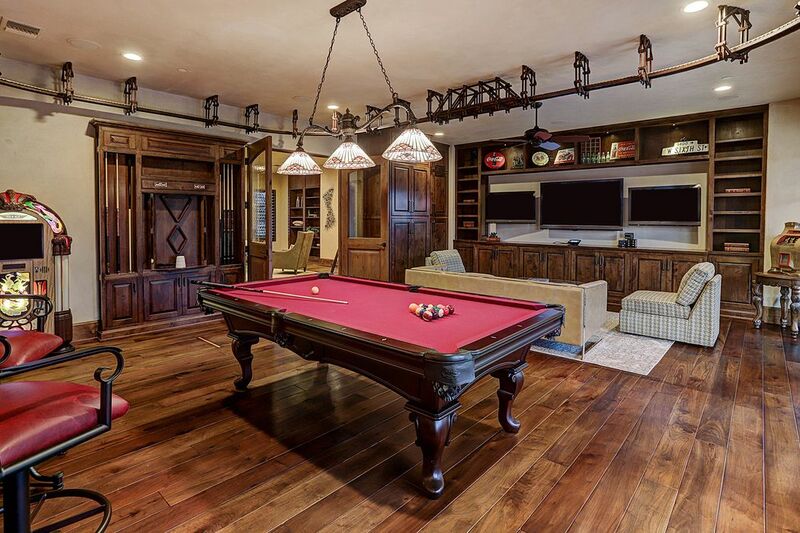 Multiple "green" energy-efficient features, home built like a fortress to Miami-Dade County hurricane standards, superior technology and home automation system (including Crestron & Lutron). Two private walled gardens and backyard paradise including outdoor kitchen, outdoor living room with fireplace, sparkling pool, spa, water garden and fire pit, native plants, fruit trees and herbs, extensive irrigation system, covered parking for seven cars, and an auxiliary building that can be converted to a casita. 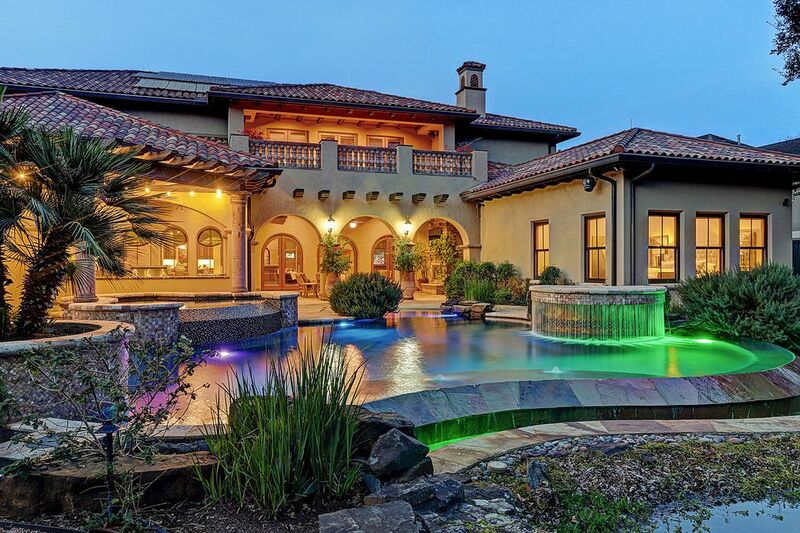 Magical home! 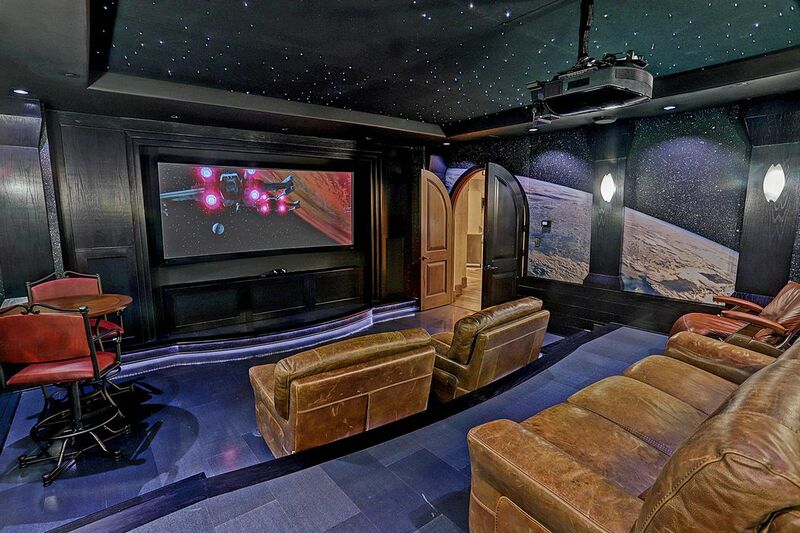 MSN, "This $4.7M Bellaire Mansion is a Star Wars Fanatic's Dream Home"
Houston Chronicle, "This $4.7M Bellaire Mansion is a Star Wars Fanatic's Dream Home"
Houstonia, "On the Market: A Bellaire Mansion with a Star Wars Movie Theater"